A new economic analysis finds that San Diego State University is a powerful driver of the regional economy, generating $5.67 billion in economic activity and supporting 42,000 jobs. 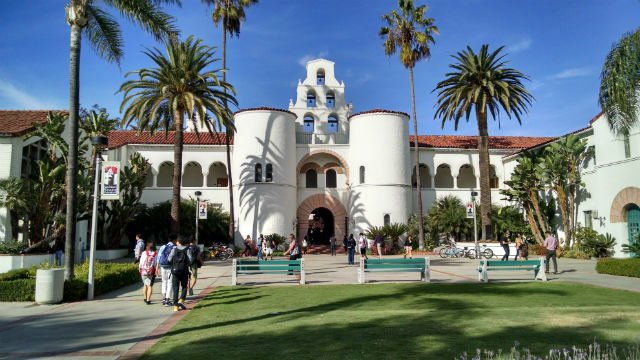 SDSU’s activities also generate significant tax revenue for state and local governments—approximately $457 million annually. The report was prepared by ICF, an international consulting firm based in Fairfax, VA, that specializes in economic impact studies. It was released Nov. 16. The new analysis comes as the university is seeking to build public support for a ballot measure allowing it to purchase the former Qualcomm Stadium site for expansion. The ICF study examined direct, indirect and induced economic impacts and found that for every dollar California invests in SDSU, the university returns $35.20 to the economy. The university serves more than 36,000 students and offers bachelor’s degrees in 95 areas, master’s degrees in 78 areas and doctorates in 22 areas. It’s campus in College Heights is largely built out.